Display and Main Unit are available certified to comply with Atex for use in zone 2, sensors to zone 1. The digital display is backlit to increase the contrast and for use in darkness. Audible and visual alarms can be generated and an inbuilt self diagnostic fault finding system is incorporated. 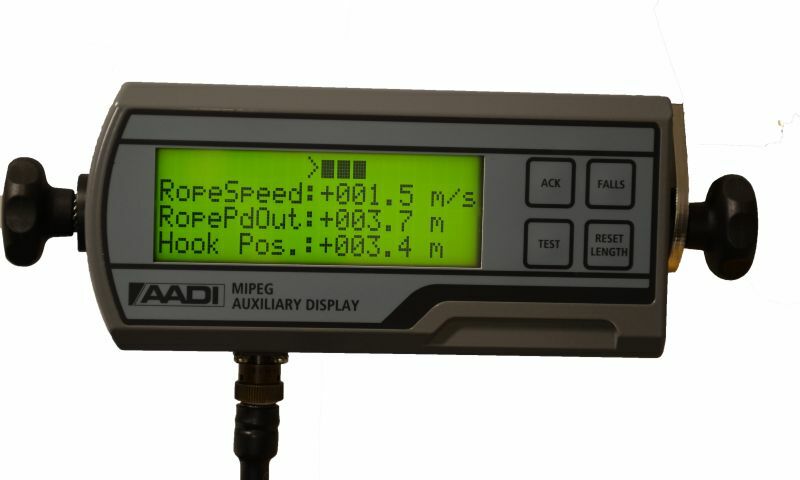 The Mipeg RSI has been design to give the crane operator information on hook position and movement. This is especially useful when the hook is not in his line of sight i.e. working sub-sea or "blind". Outputs can be generated to prevent the rope paying completely off the drum, and also to act as an anti two block system preventing over hoist. If integrated with a Mipeg 2000 Recording system, ton-miles records for rope life evaluation can be provided. The display comprises 4 lines of 20 characters, 10 mm in height. The display is back lit for night time operation and has 4 hermetically sealed push buttons. The push buttons are used for selecting features and calibration purposes. An absolute rotational shaft encoder is used to measure both speed and direction or the slew angle position of the crane. The sensor is not affected by power loss. Operating temperature is from -20 to + 60 degrees C. The sensor is sealed to IP 66. Other sensors are also available. The microcomputer with all required interface circuits is mounted in an enclosure sealed to IP65 Operating temperature range for the unit is -10 to + 60 degrees C.
The boom angle sensor is a gravity based sensor measuring the boom inclination. The sensor is sealed to IP66 and the operating temperatures is between -40 to + 65 degrees C.
The Mipeg X is expandable and flexible. The Safe Reach Indicator may be selected and displayed as a standard option in the Safe Load Indicator package.